What’s at the top of most house-hunters’ wish lists? A property with potential? Tick. Close to good schools? Tick. A first-floor apartment with high-ceilings? Tick. But there is one more must-have that is often hard to find: outside space. It comes in many shapes and sizes from roof terraces and balconies to private courtyards. This is a place to unwind over the summer months or enjoy autumnal evenings with food, fun and friends. If you long for your own open space with access to the sun or the stars, here are six properties for sale across Belgravia, Kensington and Chelsea, that fit the bill. This short, but perfectly formed street diverges from West Halkin Street just past Belgrave Square. West Halkin Street is home to Mosimann’s (www.mosimann.com) restaurant and Waitrose is nearby. This superb seven-bedroom stucco town house is prime property in an ideal location. Its outside space is supplied with a roof terrace, giving unusual chimney-top views of the area. There is also the option to negotiate access to the gardens in Belgrave Square. The property is on the market for £12.95m. Lined with cherry blossom trees, this street is a quiet backwater close to Kensington Gardens. It’s the epitome of gracious London family life, as depicted in classic films from Peter Pan to Mary Poppins. And your family would love this four-bedroom triplex set over the lower ground, ground and first floors of a beautiful Victorian villa. It has a west-facing garden, and a first-floor balcony overlooking the street. The property is on the market for £3.95m. For more details, please contact us on 020 7235 8861. The Cadogan Estate covers about 93 acres of Chelsea and Kensington. It has remained in the same family for more than 300 years. The manor of Chelsea was bought by Sir Hans Sloane in 1737 and his daughter married the second Baron Cadogan, creating the dynasty which continues to this day. You could certainly live like a lord in this six-storey freehold town house. The communal gardens are accessible to residents, but you have two terraces and a patio of your own to enjoy – for the princely sum of £12.5m. This grand thoroughfare links Eaton and Belgrave squares and was once home to Alfred, Lord Tennyson. Most of the houses have been turned into flats. Here we have a two-bed apartment on the second floor. There is a lift and a resident caretaker in the building. Owners can negotiate access to the communal gardens in Belgrave Square, which include a tennis court. The flat is for sale with an asking price of £3.5m. This pretty street of pale, low-rise cottages sits quietly in an area of corner cafes and on-trend boutiques. Just a short stroll away is Brompton Road, with its buzzing shops and eateries, and cultural landmarks, such as the V&A. 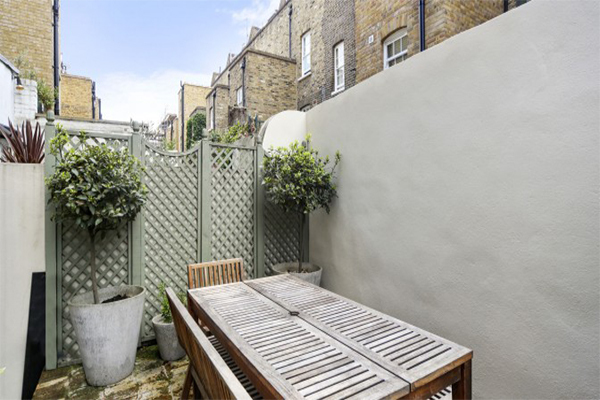 This Chelsea town house has three bedrooms, plus a garden, and is on the market for £3.45m. This lovely Belgravia lane grows lovelier the further north you walk along it. Just a stone’s throw from Knightsbridge, it has a villagey feel all of its own. The two pubs (Wilton Arms and Nag’s Head) no doubt contribute to this, but there’s a little general store, too, and the houses are festooned with flowers. This two-bedroom home (£2.95m) has not only a double-height conservatory, it has a patio garden, as well. Are you thinking of moving? For advice on letting, buying, selling, or a free valuation, contact Henry & James at 1 Motcomb Street, London SW1X 8JX (020 7235 8861; belgraviaoffice@henryandjames.co.uk).